Francis T. Kleber was an officer aboard the USS West Virginia during the battles of Surigao Strait, Iwo Jima, Okinawa and others. Read his stories on Commentary on the Philippine Islands Invasions and The Battle for Mt. Suribachi. 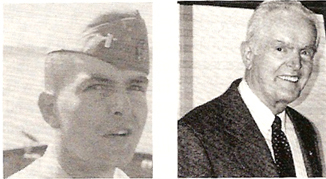 Francis T. Kleber, Commander, born April 23, 1924, Chicago, IL. Earned BS degree, USN Academy and MS degree, USN Post-Graduate School. He joined the USN June 7, 1944, and was stationed mostly in Hawaii, Norfolk, Washington, DC and San Diego, but mostly in the Pacific. Served on "Wee Vee" August 1944 - August 1945; also in minesweepers, destroyers, cruisers and amphibious forces. He had four seagoing commands in his 20 years of naval service. CDR Kleber was discharged Oct. 31, 1964. He received all the usual medals for the Pacific Theater during wartime and four Battle Stars. After the navy, he spent 20 years in nuclear/aerospace R&D. He married Evelyn Coker (from Nashville, TN) and they live in San Diego, CA. They have four sons and five grandchildren. His hobbies are tennis, acting and singing.